Australia Team for ICC World Cup 2019: CA Announces 15-Man Squad, Steve Smith and David Warner Return, Peter Handscomb and Josh Hazlewood Left Out! The ICC Cricket World Cup 2019 is scheduled to begin from May 30. This will be the 12th edition of the Cricket World Cup which will be hosted in England and Wales. 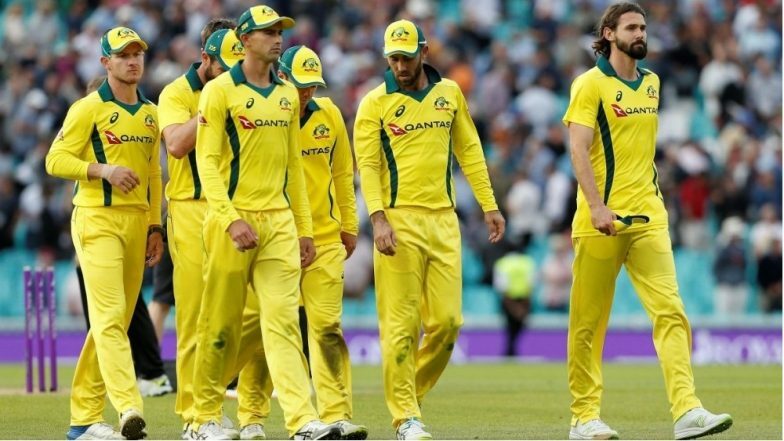 Cricket Australia has announced their 15 members squad for upcoming World Cup in which they have left out big names like Peter Handscomb and Josh Hazlewood and make way for Australian batsmen David Warner and Steve Smith. ICC Cricket World Cup 2019 Schedule in PDF: Ticket Prices, Dates, Venue Details & Timetable Available for Download Online. Warner and Smith will make a come back to the Australian side after a long gap, as they were suspended due to ball tampering case during a test series in South Africa last year. The right-handed Australian batsman Peter Handscomb could not make it to the 15 member squad for ICC World Cup 2019 which came as a shocker as he was in great form and had a wonderful series against India this year. Even the Australian pacer Josh Hazlewood would not be seen in the upcoming Cricket World Cup. The axing of Australian batsman Handscomb indeed was a tough call for Australia Cricket as he had an average of 43 in 13 games this year, including a superb maiden one-day hundred in India. The left-handed Australian batsmen Usman Khawaja made it to the squad for the World cup due to his excellent batting in recently concluded series against India and Pakistan. Alex Carey will be the sole wicket-keeper for the Australian team in their world cup campaign. ICC World Cup 2019 Kit: Apparel Manufacturer ASICS Uses Aussie Batsman Glen Maxwell to Unveil Australia’s World Cup Jersey. Australia will begin their Cricket World Cup 2019 campaign against Afghanistan on June 1 against Afghanistan at Bristol. The Australian side will be led by right-handed batsman Aaron Finch. The final of ICC World Cup, 2019 will be played on July 14 at Lord's Cricket Ground, London.